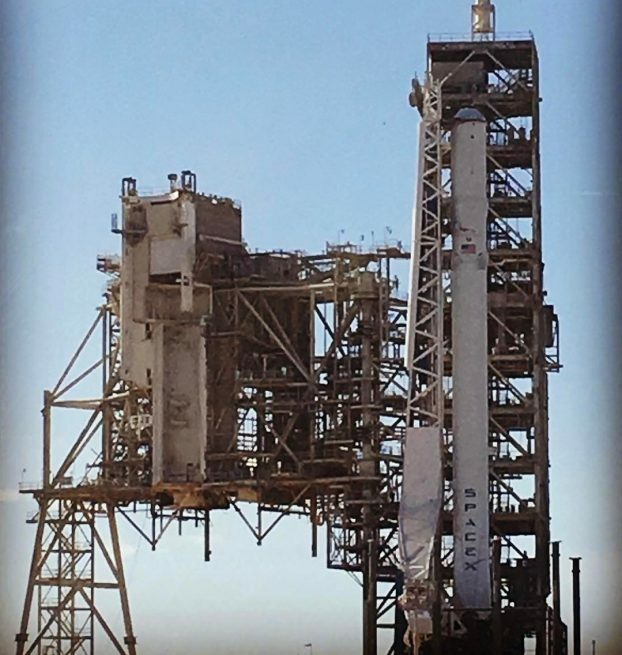 KENNEDY SPACE CENTER, Fla. — In a sign that SpaceX is finally ready to launch from Kennedy Space Center’s historic Launch Complex 39A, the company rolled its Falcon 9, mounted atop a brand-new transporter erector, up the incline to the top of the pad. The rocket was moved on Friday, Feb. 10, 2017, in advanced of a static test fire it will conduct as early as Saturday. The Falcon 9 was raised to its vertical position at about 3 p.m. EST (20:00 GMT). It was just the two-stage booster, as the payload, the Commercial Resupply Services (CRS) 10 Dragon capsule, will not be attached until after a successful static test fire. SpaceX plans to launch the rocket to space on Feb. 18. This is the first time a rocket of any kind has been atop the storied launch pad, which saw all the Apollo program Moon missions bound for the lunar surface, and a majority of Space Shuttle flights launch from this spot. The last mission to occur here was the final Space Shuttle flight, STS-135, in July 2011, which saw Space Shuttle Atlantis launch to the International Space Station on a resupply mission. Now, five-and-a-half years later, CRS-10, an unpiloted mission, also aims to resupply the outpost. 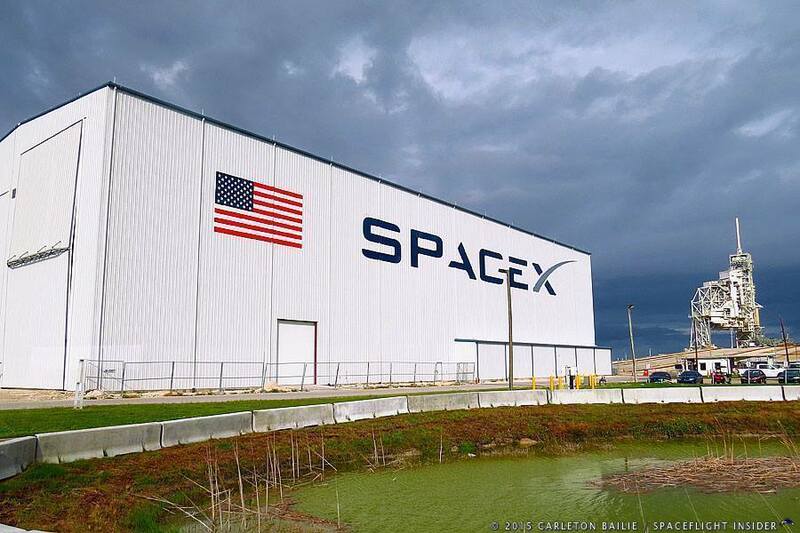 SpaceX leased the complex in 2014 and has since modified it for processing and launching its Falcon 9 and Falcon Heavy rockets. Modifications included the construction of a horizontal integration facility just outside the pad perimeter, built over the crawlerway that brought Space Shuttles and Saturn Vs to the site. CRS-10, pending a successful static test fire, is scheduled to launch at 10:01 a.m. EST (15:01 GMT) on Feb. 18. It will send 4,473 pounds (2,029 kilograms) of pressurized and 2,154 pounds (977 kilograms) of unpressurized cargo. If it launches on time, it should rendezvous with the space station about two days later. It will be captured by the robotic Canadarm2 to be berthed to the Earth-facing port of the Harmony module. It is expected to stay attached to the outpost for about 30 days before returning to Earth and splashing down in the Pacific Ocean just off the coast of Baja California for recovery and eventual reuse. In a Feb. 6 report from Reuters, SpaceX said that it hopes to launch at as much as once every two weeks after the CRS-10 mission. This was a rate the company was already approaching before the Sept. 1, 2016, explosion in the minutes before a static test fire. The explosion destroyed the rocket and payload and severely damaged Space Launch Complex 40 (SLC-40), which is just south of LC-39A. The company has since resolved the issue that caused the explosion and already returned the Falcon 9 to flight. That came on Jan. 14, 2017, when SpaceX sent 10 Iridium NEXT satellites to orbit from Vandenberg Air Force Base. The CRS-10 mission will be the first SpaceX launch from the East Coast since the accident. For the time being, the company will be launching all its East Coast Falcon 9 rockets from LC-39A until SLC-40 is repaired. Once SLC-40 is active again, the company will then have two launch pads in Florida to help with its backlog of more than 70 missions. I hope they cut up that Shuttle structure before the rust takes it down. They got rid of the Apollo stuff fast enough.